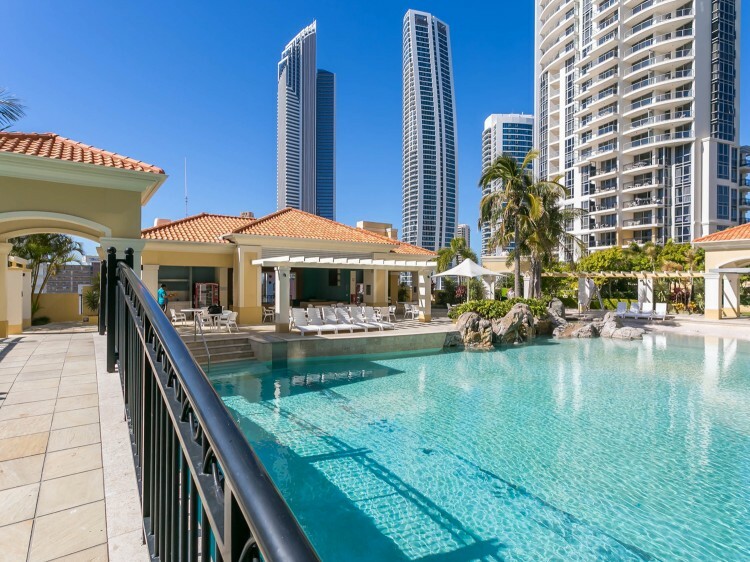 Mantra Towers of Chevron offers quality 4 star holiday apartments situated in the heart of Surfers Paradise on the Gold Coast. Three majestic towers make up the Chevron Towers, ranging from 35 to 50 levels high. 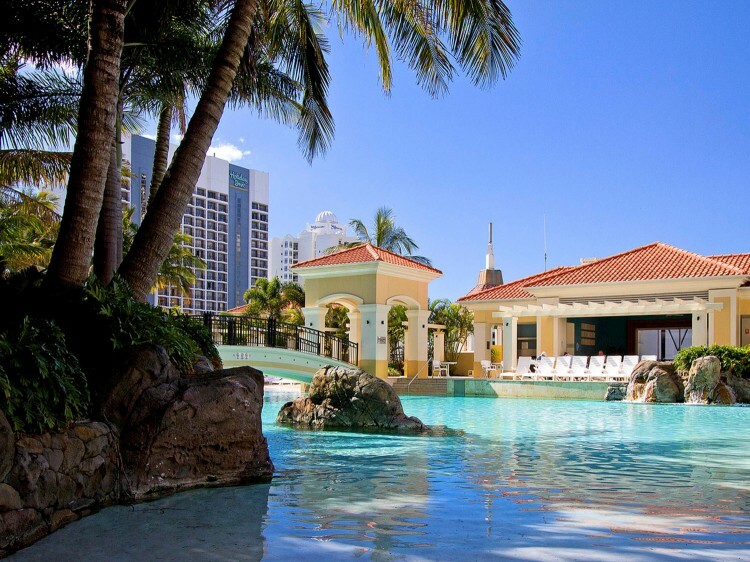 Each apartment features scenic views ranging from the Pacific Ocean to the Nerang River and Gold Coast hinterland and is individually decorated to create a holiday lifestyle during your stay. All apartments are fully self-contained and feature contemporary kitchens, fully equipped laundries, spacious living areas, complimentary cable TV and balcony. Mantra Towers of Chevron offers a unique shopping and dining destination. This beautifully landscaped open-air shopping area containing beautiful water features offers a relaxed shopping experience. 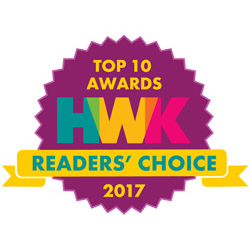 Your one stop for convenience with a major Coles supermarket, pharmacy, medical centres, baker, newsagent and so much more. 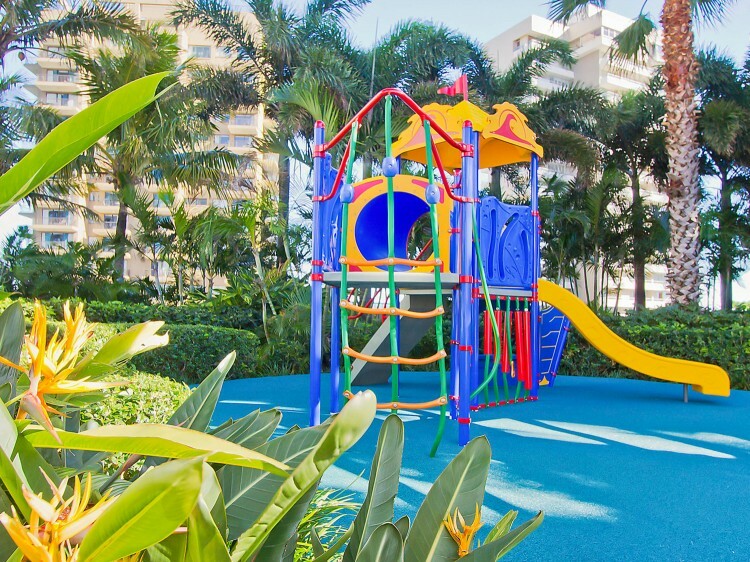 Set amidst tropical manicured gardens is the unique 'Beaches in the Sky', a 1.25 acre recreation area located on Level 5. This private sanctuary offers an expansive 600sqm bell-shaped lagoon pool with grotto spas surrounded by white sandy beaches. Landscaped subtropical gardens provide shade for the many barbeque and entertainment areas surrounding the pool. Also located on Level 5, the Health Pavilion has all of the facilities you need to maintain your health and fitness while holidaying on the Gold Coast. Facilities include a 25m heated indoor pool and spa to indulge you in the colder months. Relaxation areas, male and female saunas, change rooms and a fully-equipped gymnasium are also available. Open 6:00am to 10:00pm daily. Mantra Towers of Chevron also offers a theatre and club lounge for guests. Located in Skyline Tower (T1) on level 2, the private theatre can seat up to 18 people and is available for hire at the Reception (for use by in house guests only). Families and groups can watch DVDs, in the air-conditioned cinema-like environment. The games rooms have a variety of arcade games perfect for kids and adults including pool tables and an air hockey table. Open 6:00am to 10:00pm daily, located on level 1 in Skyline North Tower (T2) and on the Ground Level of Tower 1. Chevron Renaissance offers a unique dining and shopping destination. This beautifully landscaped open-air area offers a relaxed shopping experience. Boutiques, fashion, jewellery and accessory stores are all easily accessible. Alfresco dining, cafés and bars offer a variety of cuisine and ambience making it a popular spot to relax. Treat yourself to some well deserved pampering in one of the many salons or day spas. Chevron Renaissance is your one stop for convenience with a major Coles supermarket, pharmacy, medical centres, baker, newsagent and so much more. These apartments are equipped with a full kitchen, white goods, cable TV and many other facilities to help you fully relax during your stay. Please note all 1 bedroom apartments are below the 12th floor. Generously proportioned, modern and contemporary in style apartments feature a stylish open plan kitchen and modern appliances. Most living room spaces, main bedrooms and second bedrooms open up to private balconies. Generously proportioned, modern and contemporary in style fitted, apartments feature a stylish open plan kitchen and modern appliances. Most living room spaces, main bedrooms and second bedrooms open up to private balconies. Located on various levels and are designed for optimum lifestyle enjoyment. Main bedrooms are large and feature ensuite bathrooms, walk in in robes and a private balcony. 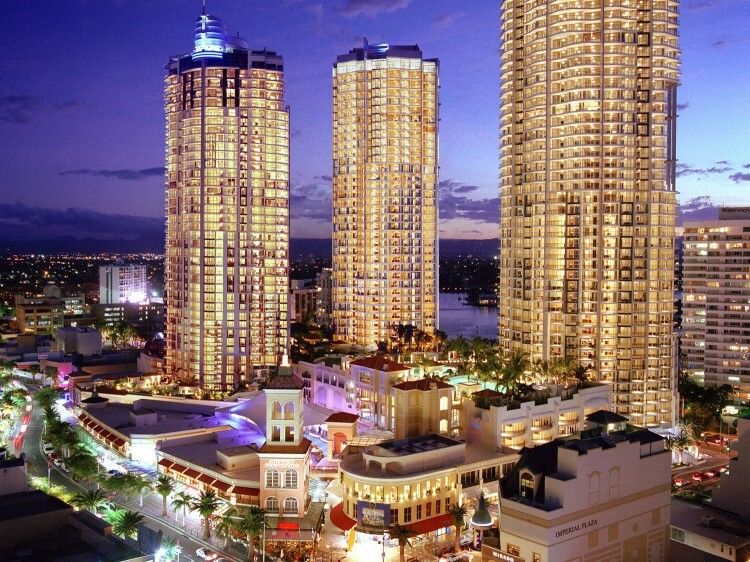 Higher situated apartments offer spectacular views of the ocean, rivers, hinterland and Gold Coast landmarks. Located on levels 1 and 2, these west-facing apartments offer walk in in robes and a private balcony. Open plan kitchens are ideal for entertaining and feature marble top benches with beautiful wood veneers. River / Hinterland outlook. Featuring spacious layout and modern design aspects in the lounge and bedrooms accompanied by breathtaking ocean views ensuring your stay will be unforgettable. Main bedrooms are designed with a large open plan layout featuring an ensuite bathroom, walk in robe and private balcony. Fully equipped kitchens feature timeless marble top benches and beautiful wood veneers. There are 2 bathrooms and a separate laundry.